I’ve done it. I’ve committed this sin in hallways, over telephones, even at family functions. We have all committed this sin, I suspect. We practice this offense against God so often and so causally, I wonder if we even think of it as anything but accepted or normal. You know what I’m talking about…gossip. The accepted Christian sin. Gossip is so commonplace among believers that we forget to mention it in the list of “real” sins. How, though, do we justify this sin of the tongue and what does God really thinks of it? How has gossip become the sin on everyone’s lips? Gossip, in the church, spews its ugly head in many different ways. Sometimes it is simply friends telling another friend what has been told to them. Sometimes it is assuming that others have already obtained the same information as you, thus you “slip” and say something that perhaps you were not entitled to share. One of the most noxious ways in which gossiping occurs is under the guise of “sharing a prayer request.” So-and-so really needs prayer for their circumstance and, so, you take it upon yourself to ask others to pray for their secret situation. Suddenly, it’s not so secret anymore and you have sinned while pretending to be holy or righteous. If you practice gossiping, however, what does that say about you? Gossipers are often concerned with exposing the faults, weaknesses, or sins of others. They take pride in being seen as those in the “know” or in the loop. They tend to be insecure themselves and find spreading gossip to be a source of pleasure. Gossipers are linked in this verse alongside “slanderers” and “God-haters.” Ouch. Most of us don’t consider our little story about our friend Katie and Joe getting a divorce to be on par with being a “God-hater”, but God certainly does. Gossip stirs up strife and disunity, whether we intend for it to or not. It causes harm to our brothers and sisters and, as a result, God takes it seriously…and so should we. I’ll admit, too, that many gossipers are women. Women are chatty and caddy sometimes and, look, we like to talk. I used to be a gossiping girl. I didn’t mind sharing information. I always had a hesitation in my spirit, but I just went ahead anyway. I had been the victim of horrible gossip and painful rumors, so you think I’d have been more sympathetic. Then, I got a job as a waitress with about 15 other girls. I was the only Christian. You can imagine the amount of gossip swirling about. I decided that I wanted to be a witness, not a destructive gossiper. I realized then and there that God hates gossip. I stopped listening. If someone began to share something I didn’t want to hear, I asked them to stop or I walked away. The result was many of the girls knew they could, in fact, trust me. They began to share genuine heartache and distress and I was able to share Christ’s hope and love. Gossip has overtaken the church, in part, because we don’t keep ourselves or others accountable. We also fail to know what God really says about gossip. If you hear someone begin with “Well, just between you and me…” tell them to zip their mouth. They’ll learn soon enough to stop sharing with you. And if you are the one gossiping, think about this: “A good-for-nothing man is digging up what is bad, and upon his lips there is… a scorching fire” Proverbs 16:27-28. Don’t be good-for-nothing. Why do you think gossip is so prevalent in the church? Have you been harmed by gossip? Do you struggle with holding your tongue? 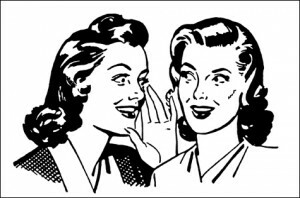 How can we resist the urge to gossip? I’m with ya on it being “the accepted Christian sin” under the guise of “prayer requests”. So subtle, yet for a new believer one thinks it’s the norm. When I became a new believer I heard a lot of these “prayer requests”. I was conflicted because, in my gut (now I know it was the Holy Spirit), it seemed wrong to know this information about someone not being there. Thanks for this post & shedding light on this issue that often gets overlooked! Crazy when that happens but so like God! Gossip takes away credebility from the speaker and robs the listener of their innocence. “Gossip takes away credibility from the speaker and robs the listener of their innocence.” I love this! Oh, so good. I love that mindset. I’m going to remember this one. Thanks Julia. I’ve definited gossiped, but it isn’t one of those sins I’ve struggled with. I have a LONG list of sins that God is working out of me, but gossping hasn’t been one. And I think this is why (or rather one of the reasons why) I am not part of the “inner” circle of friends. I’ve always had a lot of friends, but when I don’t engage about “them” or “her” or “him” I become boring or worse, a conversation killer. My mantra among friends (even co-workers) used to be “I’m the last one to know anything.” This is true with my friends and family. Because I don’t gossip. Nobody tells me anything. ;) I am suprised at how I gossping even among my Christian sisters, but have also been really grateful for those who purposely try not too gossip. I know it takes a lot of effort because it does indeed spread like wildfire! Definitely encouraged and reminded of sin and how God views our thoughts, intentions and “little” sins that have severe results…in the end, it’s not worth it. When I read this post, I immediately thought of the ill-born phrase “healthy venting.” Somewhere along the line, we’ve come up with the notion that talking endlessly about our problems with different people, and other peoples problems that we feel burdened by. I have both been that person, and been on the opposing end of that venting/gossip in the past, and it only ends up hurting people. I don’t think it’s easy, either. Being able to dish out the latest greatest news about so and so, or what’s happening between x and y…it can give you a high. But that’s just it. Gossip is a drug, an addiction of speech. An emergency conversation steroid used to impress family and friends alike. Let us be people who are more creative with our words, and who search for meaning and life-giving diction. When I read this post, I immediately thought of the ill-born phrase “healthy venting.” Somewhere along the line, we’ve come up with the notion that talking endlessly about our problems with different people, and other peoples problems that we feel burdened by, is good. I have both been that person, and been on the opposing end of that venting/gossip in the past, and it only ends up hurting people. Oh wow! God and I were just talking about that this morning! I have done it too. But my prayer is I will do it much less and to be aware of it’s temptation and to walk away or change the subject! Great post!